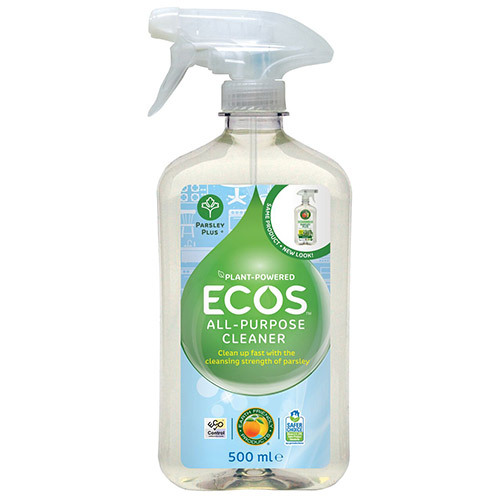 This formula is extraordinary effective at cleaning everyday dirt and grease from hard surfaces with thoughtfully source ingredients. Parsley essence adds an energising cleaning power. Perfect for cleaning stone countertops such as sealed marble and granite. Vegan, cruelty free and carbon neutral. Water, <5% Non-Ionic Surfactants, Propanediol, Potassium Sorbate, Denatured Alcohol, Perfume and Citric Acid. Spray directly on surface to be cleaned. Wipe with a damp sponge or cloth. Be sure to test all surfaces in an inconspicuous area prior to use. Repeat as necessary if heavily soiled. Below are reviews of ECOS All-Purpose Cleaner - Parsley Plus - 500ml by bodykind customers. If you have tried this product we'd love to hear what you think so please leave a review.